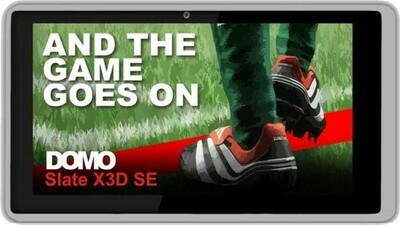 Upcoming brand Domo launched its Domo slate X3d-SE tablet aiming at tho so avid gamer who look for comfortable touch sensitivity and great sensors to match up with their gaming needs.With this tablet users can play with all the 3d games that they ever wish to but they didn’t get a good device to support it. This tablet runs on Android’s 4.0(Ice cream Sandwich) platform powered by 1.2 GhZ Cortex A9 processor which promises to support the users when they play complex games.It also has accelerometer and G sensors which help the gamers to play comfortably. At a comfortable price this tablet promises to create a niche for itself in the tablet market.